Description: Miniature map of New Guinea showing a possible land connection to Australia. The existence of the Torres Strait, which separates the two landmasses, was only confirmed in 1770 by James Cook. Coloured. Description: Part of New Guinea, Timor and New Britain showing the discoveries of William Dampier, the first Englishman to explore northwest Australia, and the first person to circumnavigate the globe three times. Coloured. Description: Papua New Guinea. Route of James Cook (1768 - 1771) and William Dampier (1699 - 1701). French Edition of Cook's Voyages. Description: New Guinea. Detailed map with inset of part of the South Coast and Gulf of Papua. Based on the survey of Sir Coutts Trotter Bart. Printed colour. 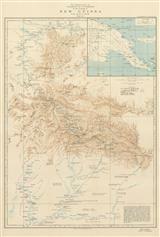 Description: Sketch map of Papua New Guinea illustrating the discoveries of the Scottish missionary James Chalmers. Printed colour. Description: Interesting map of Papua New Guinea and the Gulf of Papua with discoveries made by the 'Victory' Expedition, comanded by Theodore Bevan. Printed colour. Description: The Owen Stanley Mountain Range in Papua New Guinea, charting the route of explorer and colonial administrator, Sir William MacGregor, Printed colour. 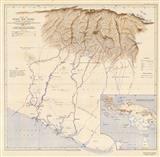 Description: South Eastern New Guinea, mapping the route and exploration of the expedition of D. Mackay and W.S. Little. Printed colour. Description: Western New Guinea. Map to illustrate the explorations of Captain C.G. Rawling and Mr. E. Marshall from 1909-1911. Printed colour. Description: Dutch New Guinea. To illustrate the expeditions of H.A.Lorentz 1907-1909. Original colour. Description: Western Papua showing routes followed by W.N.Beaver. Original printed colour. Description: Map showing the route from South to North across New Guinea, illustrated with topographical information and annotations. With inset overview map of the territories of New Guinea and Papua owned by the Dutch and Australians. Printed colour.